This week, in New York City, representatives from more than 100 countries will begin collaborating on an international treaty, first proposed in 2016, to ban nuclear weapons forever. It makes sense for every country in the world to seek a legally binding ban on nuclear weapons. It would make even more sense to immediately deactivate all nuclear weapons. But, by boycotting and disparaging the process now underway, the U.S. and other nuclear armed nations have sent a chilling signal. They have no intention of giving up the power to explode, burn and annihilate planetary life. “The United States is spending $1 trillion USD over the next thirty years to modernize its nuclear weapon arsenals and triple the killing power of these weapons,” says Ray Acheson, programme director at Women’s International League for Peace and Freedom (WILPF). Acheson also notes that the excessive spending for nuclear weapons contrasts with U.S. cuts to vital anti-poverty programs. On June 19th, more than a dozen people blocked the U.S. Mission to the UN entrance to protest Washington’s boycott of the negotiations. They were arrested for disorderly conduct, but I believe it’s incomparably more disorderly to plan for nuclear war. The trio then clambered through the hole in the fence and entered M-10, a Minuteman II missile site at Whiteman Air Force Base in Knob Noster, Missouri. I did so, and he poured water down my throat. Recalling his kind offer to give me water jolts me into awareness about the relationship between the nuclear weapon below us, that day, and massive numbers of people, then and now, who acutely need clean water. This wakefulness entails abiding care for others. Jean Gump and Jane Addams practiced such care throughout most of their lives. 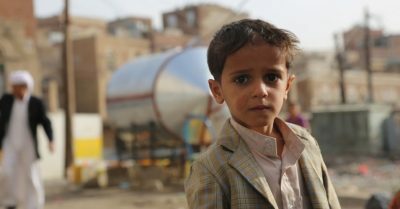 We, likewise, can work toward justice for those who live in communities like Flint; we can seek sane approaches to the climate crisis; and we can insist that those who are targets of war, like the cholera-ridden, desperately hungry children of Yemen, be spared from aerial terrorism and given full access to clean, life-saving waters. Kathy Kelly ([email protected]) co-coordinates Voices for Creative Nonviolence (www.vcnv.org).